We visited these falls two weekends ago. It was about an hour and a half away in the South Mountain State Park. We only had time to explore this trail to see the falls, but it was the reason we went there in the first place so that was okay. The entire loop was only 2.5 miles in length and the most strenuous part were the millions of steps it took to reach the upper falls. Okay, so it probably wasn't a million, but it was a whole lot! My calves and thighs were burning, but once we reached the the top, it was a piece of cake. 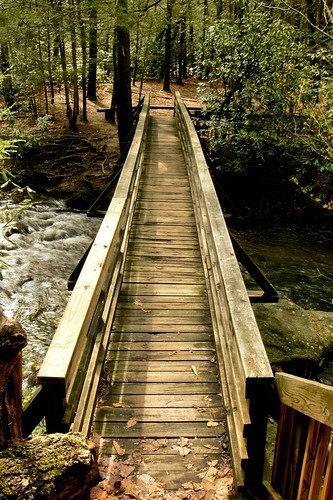 Upon reaching the upper portion of the falls we crossed a nifty little bridge, and it was all down hill from there. This particular fall proved to be extremely difficult to capture, mostly due to the copious amount of visitors crowding the trail. I had to move every time people needed to get by, and then there were those nice people who didn't want to cross in front of the camera. I didn't really want to make them wait, then a line would start forming! 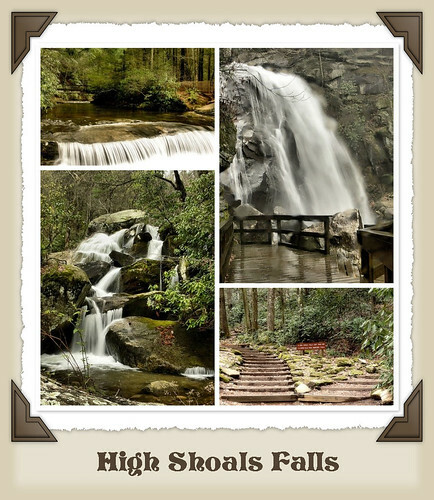 The High Shoals Fall was throwing off buckets of mist. I could barely keep my lens dry, and there really weren't any other angles to shoot it from further away. The trail was nothing but stairs closer to the top, so deviating from the trail was not an option. Had their been less people it would have allowed more time to get a better shot, but it's not a perfect world, now is it?!?! It was an overall great hike, with a beautiful fall. The only issue I have is that I didn't get as much time as I would have liked to just linger. I'm sure there will be a next time. I'm thinking that I would like to go back in the fall?! The books beauty rating was a 7, I thought that this was a pretty grand little waterfall to only get a seven, but maybe it was because of the decks, or the people?! I don't know.......my beauty rating.....hmmmm....maybe 8.5......what's your beauty rating? I'm infatuated with that color green on that fiddlehead (I wasn't sure what it was). 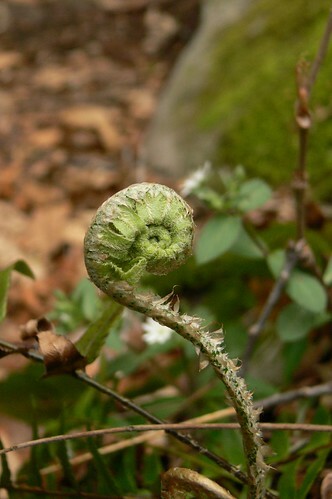 TD: Thanks...I'm not sure what it is...I would have said baby fern...but I like fiddlehead too! greg: I'm with you there, although I've seen some pretty sad waterfalls as we've went through our droughts....thank you! "LIKE" the WW FB Page!